Our monogram summer travel tote bag is bright and bold, bursting with color and fun and just calling you to set off on vacation. Carry this vibrant hot pink tote to the beach, the pool or seaside mall. It is large and spacious and can hold a towel, sunscreen, a novel or all your retail purchases! The handles and piping on top feature a summer floral design that is repeated on our matching laundry bag item CC-CLB92292, the summer duffle item CC-BBD92254 and the camp duffle CC-DFC92315, giving you a great choice for a mix and match set of accessories. Embroider the tote with your name or initials for a personalized finish. 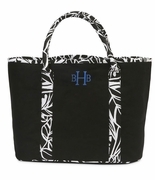 The personalized travel tote measures 16"W x 12.5"H x 8" across the bottom.